This blog has been fortunate enough to have posts listed on both BoingBoing (a.k.a. A Directory of Wonderful Things, Self-Serving Rants, and Advertisements for the Authors' Pet Projects) and Joke A Day (a.k.a. Making Fun of Morons and Providing Links to Open Directories of Naked People Since 1863). Therefore, this blog is in the unique position of being able to evaluate the realtive merits of these two sites in the all-important characteristic of "what can they do for me, a small-time blogger". 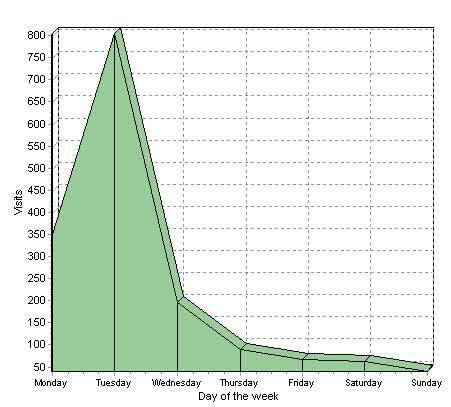 As can be seen in the SiteMeter graphs below, both peaked at around 800 hits per day. Not bad for a little-seen blog that averages around 50 hits on a normal day. The hits from continued rolling in in significant numbers for nearly a week. The hits from pretty much died on day 3. This is probably due to the huge number of links posted on as compared to . 3) Total number of hits. Winner . Not really a surprise, based on (1) and (2) above, the total number of hits from received from the link over time was significantly higher than the number of hits from the link. 4) Non-lurker percentage. Winner . Readers of apparently tend to be lurkers in much greater numbers than readers of , based on the number of comments to each post. If the measure was based on intelligent comments, would win by an even greater margin. 5) Permanent references. Winner . The links from are dynamic, not permanent, and they disappear from the publicly available list in a week or so. Therefore, they don't show up in searches and don't help in Google (and other) rankings. The links from are permanent, and are available through the archives. 6) Diversity of references. Winner . Readers of apparently are more likely to have their own blogs, to which they occasionally add links to interesting things on . Therefore, the hits on the page listed on came from a much wider group of websites. Readers of tend to be more passive, as show in (4) above. There is some diversity of hits due to the ability of webmasters to put dynamic lists on their website, but those don't really count. Based on this formula, the total score for is 42.5%. The total score for is 57.5%. Therefore, the winner - and best source of hits for a small blog - is Joke A Day. Now, go out there, create something amusing, and get it posted! [Update 09/28/2005] Dang, now this post is on . So, you people going to try to up your standing by increasing you non-lurker percentage this time? Came here from Joke A Day. The sole purpose of this post is to say I'm not a lurker. But if I hadn't posted that, I would be a lurker. So is it possible for the statement of my non-lurkedness to actually cause itself to be true? Or am I just a moron?